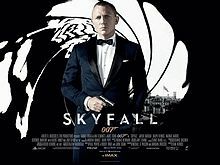 Skyfall well worth the money. So, the new James Bond movie, Skyfall, opened in Australia. Why the opening here was two weeks later than America, and four weeks after Great Britain, I have no idea. If you’ve like previous James Bond movies, you’ll like this one. The stunt scenes are well done. In the opening scenes Bond chases a bad guy on a motor bike over the rooftops of the grand bazar in Istanbul, Turkey. He crashes trough roofs, ends up fighting on top of a moving train, gets shot, and falls into an icy river, all without getting his shirt untucked from his trousers. The movie soon moves to Macau, where the photography has a golden lustre to it, which is quite stunning. At a casino, Bond falls into a pit with Komodo dragons in it, and fights his way out, again without his shirt getting untucked. There are a few historical oddities in the film. When it moves to Bonds childhood home, the house has a “priest hole”: something that would be incomprehensible to those without a little knowledge of British history. During the protestant-catholic wars in England, catholic families often had hidden passages in which catholic priests could hide when the protestant authorities came to look for them. The acting is good, although the scene where the parliamentary committee interrogates Judy Dench suffers from stilted, clichéd dialogue. Daniel Craig is still young enough to stay fit enough to play in another Bond movie or two. And as long as James Bond continues, the new Eve Moneypenny has a bright future ahead of her. Go see it. It’s worth the $17. For an experienced intelligence operative’s view of some of the mechanics and tricks used in the film, see the review in http://piperbayard.wordpress.com/ and scroll down a few entries: They were able to write their review two weeks before mine because of the opening dates. Previous PostOdd stuff I found in the papers this week.Next PostShould you be allowed to name your kid Adolph Hitler?